Take one mixi bowl. Add Paneer and milk, grind them Smoothly. Add Salt,Green chilies, Fresh Bread Crumbs, Garam masala and Mix It Well. Make small bolls and put cheese piece in the center and roll it. Do the same for the remaining. Roll The Bolls In corn flour and Then Fresh Bread crumbs. Heat sufficient oil in a kadai. Deep fry the bolls till golden brown and crisp in color. Take one pan and heat oil. Add chopped onions, chopped tomatoes, garlic, ginger, green chilies, cashew nuts and saute for 3 minutes on medium flame. Let it cool down. Grind it and make smooth paste. Take one pan and heat some oil. saute smooth paste for 3 to 4 minute. Add salt, gram masala, red chilly powder and mix well. again saute for 1 to 2 minute. Take one servin bowl and pour curry and set paneer koftas. 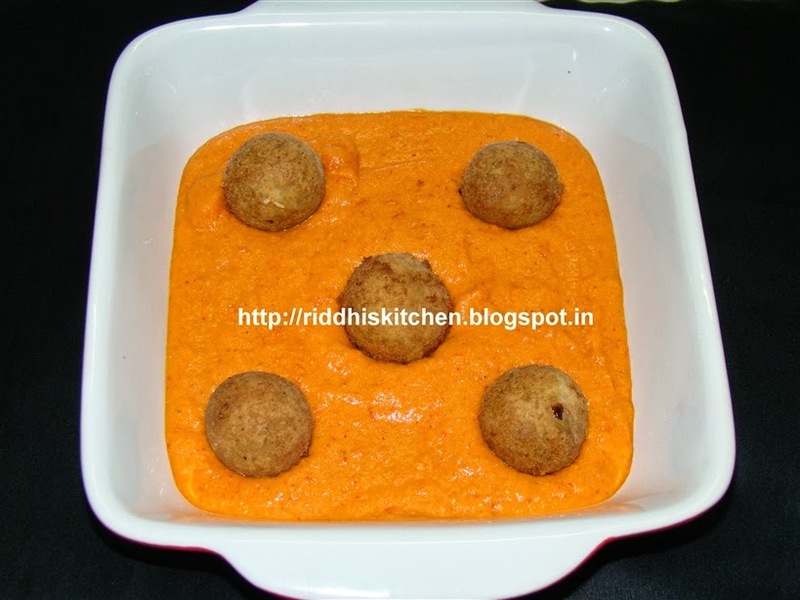 Serve Hot Paneer kofta curry with butter Paratha or butter Nan.